In early August I took a tour of the Hanford Site located near Richland, Washington. Hanford was created in 1943 to produce plutonium for nuclear bombs. Operating until the late 80’s – its 9 nuclear reactors produced enough material for 60,000 weapons. The tour encompassed the entire Hanford site – visiting locations scattered over 586 square miles via bus. The tour lasted about 5 hours. A large portion of the tour was sort of a radioactive bus safari – with the tour guides providing extensive narration of sites we drove by. The tour unfortunately did not allow computers, cell phones or cameras (none of these photos are mine – but they are what I saw). I had to resort to pen and paper for notes. A shorter tour just visiting the “B-reactor” is also offered (which does allows cameras). The EDRF (Environmental Restoration Disposal Facility) is a series of massive pits where they store low-level waste. This can include remains of buildings, contaminated soil, clothing and equipment. Hanford seems to have a lot of this stuff. I also saw countless dismantled reactors, buildings for research and processing and the Cold Test Facility (a mock-up of a nuclear waste storage tank used for testing cleanup techniques). Hanford is very active – I saw dozens of people working on cleanup. Still – the current schedule projects things won’t be fully tidy until the 2040’s. The general theme of the cleanup seems to be, “we keep finding stuff” – like weapons grade plutonium or radioactive wasps. I get the impression if I could have wandered around a bit with my geiger counter – I wouldn’t have had any trouble finding interesting samples for my electronic cloud chamber (and probably landed myself in jail). Plutonium is produced as a byproduct of nuclear fission. Fuel rods containing both uranium 235 and uranium 238 are placed in a nuclear reactor. 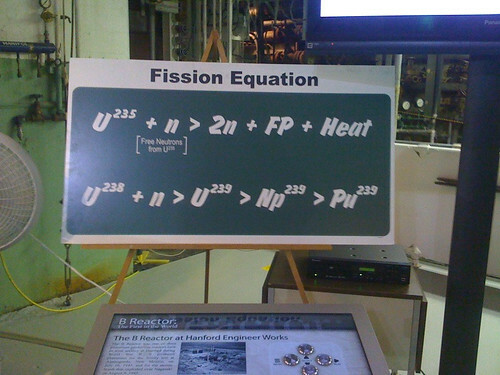 The U-235 undergoes fission – producing lighter atoms and neutrons in the process. Some of these neutrons smack into the U-238 – creating U-239. U-239 is unstable – and quickly beta decays into Neptunium 239. The Neptunium is also unstable and beta decays into Plutonium 239. And there you go! After several weeks in a reactor – a fuel rod’s plutonium content fully matures to about 1 part in 2000. Fuel rods are periodically extracted from the reactors – and stored in holding pools of water in back until they are loaded onto railroad cars (which they now can’t figure out what to do with) to be taken to processing facilities. All this gets you a tiny amount plutonium, in addition to a huge serving of uranium, highly nasty fission byproducts, mixed in with the assortment of chemicals that were used to separate the two. 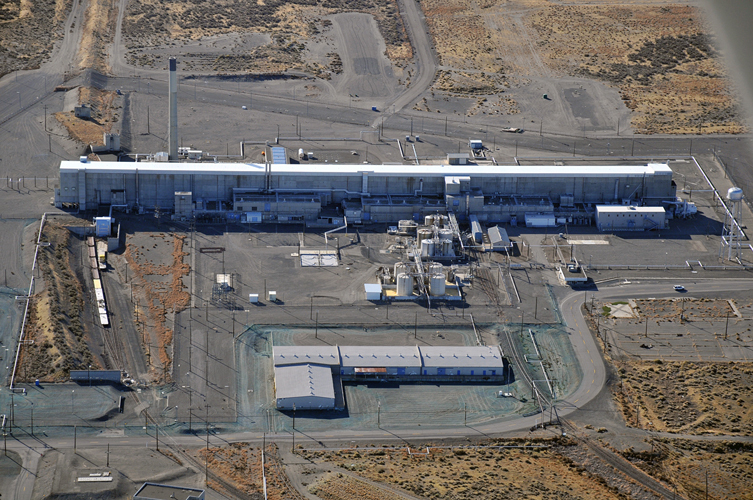 As you may guess – this refinement process is where most of Hanford’s high level waste comes from. The 53 million gallons of radioactive slurry left over from plutonium extraction was initially stored in 177 single-walled tanks. Roughly 1/3rd of these tanks have leaked. All the liquid from the single-walled tanks has been pumped into new double-walled tanks (no leaks so far!). But – the old single-walled tanks are still loaded with high-level radioactive sludge coating their insides. Part of current cleanup efforts is to de-sludge these tanks using a robotic arm system. For periods of time Hanford’s reactors were able to produce more enriched fuel rods than the processing facilities could keep up with. When they decided to stop producing plutonium – they still had a backlog of fuel rods they had to do something with. So – they decided to let the fuel hang out in the holding pools of the K-Reactors indefinitely (my notes say some sat there for 30-40 years). This did not go very well. The fuel rods liquified, then the pool cracked – leaking millions of gallons of high-level waste into the ground near the Columbia river. More at http://www.hanford.gov/page.cfm/K-Basins. Visiting the B-Reactor was the highlight of the tour. The B-reactor was the first full-scale nuclear reactor ever built (the “A” reactor being the Chicago Pile). The reactor was built to specification by DuPont in just 11 months. While most of the reactors at Hanford have been dismantled – the B-Reactor is being preserved as a museum. The reactor is staffed by about a half-dozen guides – several of them actually having worked at the reactor when it was active. After a brief presentation we were able to roam most of the reactor’s rooms on our own. The “face” of the reactor is the insertion point for the 2,004 fuel rods. Each fuel rod capsule has its own monitors for temperature and pressure. Each one of these monitors corresponds to its own gauge in the control room. A single pressure monitor going outside of parameters could cause the reactor to go into automatic shutdown. This was all done without digital technology! Like most reactors at Hanford – it was used strictly for plutonium production – not power. All info not otherwise specified is either from my own notes or http://en.wikipedia.org/wiki/Hanford_Site.